When you join Digital West, you’ll have a respected partner working by your side to help you plan for the future and make game-changing improvements in the present. We bring you top-notch, experienced CIOs (not some recent college graduate), as well as state-of-the art technologies, NOC, data center, fiber network and more. Executive leadership.We bring something no one else does: C-level IT executives with hands-on experience in your industry. This is a finite resource and we use it wisely, choosing to work with only a handful of businesses each year. Our team includes highly sought-after former CIOs and technical experts who’ve “been there, done that.” They know where the land mines lie and how to ramp up your ROI quickly. Expertise, services and infrastructure. We help you identify gaps and develop recommendations. 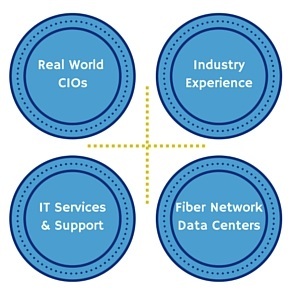 You can choose to work other providers, or we can bring our network of technical services, preferred vendors and infrastructure resources (data center, fiber network) and do it for you. One trusted partner. You’ll work with one partner — not dozens — to find scalable solutions that meet all your IT needs. We will provide you with case studies and recommendations from other well-respected organizations with whom we’ve worked. Better system performance and improved reliability. We help with bandwidth bottlenecks, frequent outages, slow up- and downloads and multi-location network design. Reduced administration. You have the option of having us manage your vendor relationships and SLAs, as well as staff hiring and project management. Better systems integration. We replace fragmented legacy systems, review vendor contracts and improve network design. Decreased OpEx and CapEx costs. We help you identify aging servers and equipment, provide access to state of the art data center resources, and find personnel savings. Strong security. We uncover system vulnerabilities, manage employee credentials and find other ways to minimize risks. Preparation for an IPO. We save you time and money by preparing your business before you go through the formal auditing process.